I have only recently been reading more kidlit. Partly because of my two littles, who are – at ages 17 months and 3.5 – currently too little to read by themselves but enjoy being read to. I’m hoping that they will continue to love books when they get older. I try to read with them, as in, show them that I too love reading. And hopefully that will show them that reading is great! Well, I suppose another part of it is helping them get their hands on books that they will love reading. Right now, it’s a lot about vehicles – trucks, cars, spaceships. Next year, who knows? (Although I guess that it will be more of the same!). I only heard of this book after it landed on the longlist of the National Book Awards Young People’s Literature. 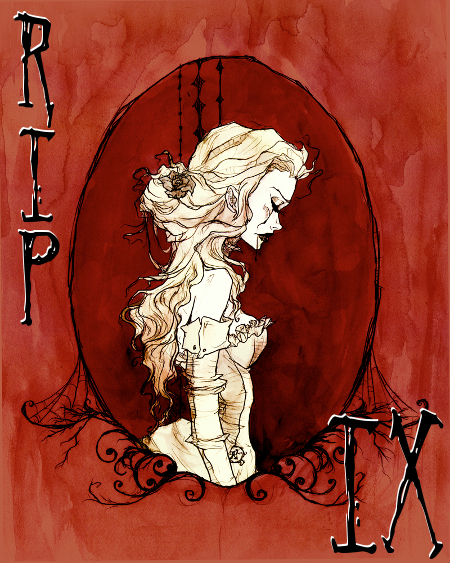 And thought that it would make a fun YA read for RIP IX. It’s wintertime at Greenglass House. The creaky smuggler’s inn is always quiet during this season, and twelve-year-old Milo, the innkeepers’ adopted son, plans to spend his holidays relaxing. But on the first icy night of vacation, out of nowhere, the guest bell rings. Then rings again. And again. Soon Milo’s home is bursting with odd, secretive guests, each one bearing a strange story that is somehow connected to the rambling old house. As objects go missing and tempers flare, Milo and Meddy, the cook’s daughter, must decipher clues and untangle the web of deepening mysteries to discover the truth about Greenglass House-and themselves. So it is a mystery, a coming-of-age tale, a ghost story, an adventure all rolled up into a book set in a smuggler’s inn at wintertime! There is plenty of fun as we discover along with Milo and his friend Meddy what the various guests are up to. There are also Milo’s worries about his family and how he is perceived by others (he is Chinese, his parents Caucasian), thoughts of his birth family and his desire to learn more about them. And the usual insecurities that a young boy faces. One of the problems with knowing nothing about the family you were born into was that you never really stopped wondering about it. At least, Milo didn’t. He wondered who his birth parents were, where they lived, and what they did for work. He wondered if they were even still alive. He wondered how his life would be different if he had grown up with his birth family, how it would be different if he actually looked like his parents and people couldn’t see immediately that he didn’t belong. He wondered how he would be different— and sometimes when he did this, he imagined himself to be very different indeed, which sort of felt like imagining a character version of himself. And oh! It has a book within a book! How I adore that. 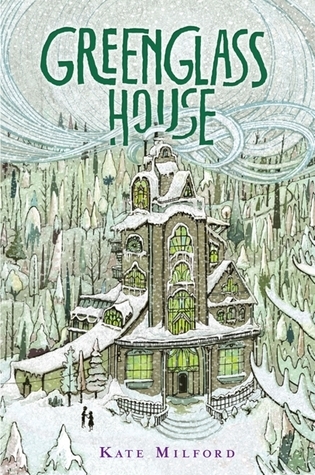 Then there’s Greenglass House itself. Set high up on a cliff, accessible via a ridiculous flight of steps or a cable railway. A bell attached to the cable railway’s winch sounds to alert those up in the inn that someone is heading their way. It was an inn, actually; a huge, ramshackle manor house that looked as if it had been cobbled together from discarded pieces of a dozen mismatched mansions collected from a dozen different cities. It was called Greenglass House, and it sat on the side of a hill overlooking an inlet of harbors, a little district built half on the shore and half on the piers that jutted out into the river Skidwrack like the teeth of a comb. And the glorious wintery setting, complete with mounds of snow outside and plenty of mugs of hot chocolate to go around. I mean, look at that cover! I wish I could visit already! (Plus it’s so hot right now I have ice water next to me and the AC on upstairs while the kids nap…. grrr….!). I have yet to read the rest of the books on the longlist, but I’m rooting for this one. Readers both young and the not-so-young will have a great time with this book. Now excuse me while I go see which other books by Kate Milford my library has! ← Previous Post It’s Monday and I’m looking forward to some cooler weather! Next Post → Weekend Cooking: Hey pesto!